This isn't just mac and cheese. 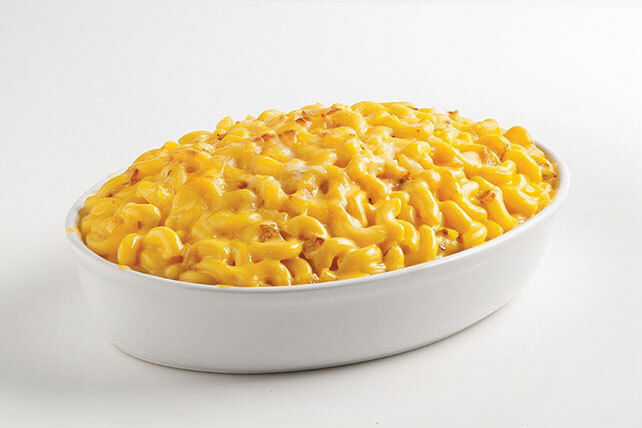 It's mac and cheese baked with a layer of shredded cheeses and topped with a secret sauce. Discover it here. Prepare Dinner as directed on package. Meanwhile, combine shredded cheeses. Whisk egg, milk and seasonings until well blended. Heat oil in small skillet on medium-high heat. Add onions; cook and stir 2 min. or until crisp-tender. Add to Dinner; mix well. Spoon half the Dinner mixture into greased 2-qt. casserole; top with half the shredded cheese mixture. Repeat layers. Drizzle with egg mixture. Bake 15 min. or until center is set and Dinner mixture is heated through. Substitute KRAFT Cheddar & Monterey Jack Cheese Cubes for the shredded colby and Monterey Jack cheese. Makes 5 servings, 1 cup each.